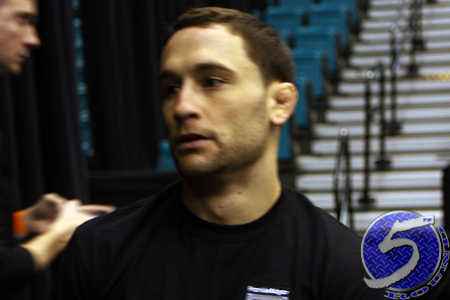 UFC president Dana White hasn’t been shy about expressing his desire for former lightweight champ Frankie Edgar (Pictured) to shed 10 pounds and drop to the featherweight division. While Edgar remains hell-bent on arranging an immediate sequel with Benson Henderson, White holds all the cards and the results are not what “The Answer” wants to hear. “I think everybody is pretty clear on what I’d like to see him do, I’d like to see him go down to his natural weight of 145 pounds,” White stated during today’s press conference. “There’s no doubt, again, when you talk about respecting a guy, I have so much respect for Frankie Edgar and what he’s been able to do at 155 pounds – because he had to, because there wasn’t a 145 pound division. While White didn’t specifically state he wouldn’t set up Edgar vs. Henderson II, the writing appears to be all over the Octagon wall. The good news for Edgar is that if he decides to follow the boss’ orders, he will instantly leapfrog into a championship affair against Jose Aldo. “Yeah, absolutely,” White flatly stated. “[Edgar] walks straight into a title shot, absolutely. Although White is pushing Edgar to relocate, it appears easy to forget this is the same man that trounced BJ Penn, who many believed was the division’s G.O.A.T. prior to facing Edgar, on back-to-back occasions. He also went on to knockout a much larger Gray Maynard in October, and his unanimous decision loss to Henderson was marred in controversy.